Matthew climbed to the top of the highest slide on the playground. "I'm the KING," he squealed with glee. As he sat on the top laughing, Rachel gave him a gentle shove, sending him flying down the slide. "Now I'm the QUEEN!" Then it was Billy's turn. He climbed the steps one by one, looking down occasionally to see how far he had come. Slowly he reached the top and proudly proclaimed, "I'M the king!" "YOU can't be the king," Matthew taunted. "You're too SCARED, and, besides that, you're too SMALL. You have to be BIG to be the king." Matthew gave Billy a mean push and sent him swooshing down the slide before he was ready. Billy landed with a thump in the dirt at the bottom of the slide. Rachel saw a tear in his eye and went to help him up. "It's just not fair. I'm too little to be the king. I'm too little to do anything," Billy whimpered. "Well, I don't think you are too little!" Rachel exclaimed. "Sometimes it's GOOD to be small. You are the only one that can crawl under the porch to get the ball when it goes under there. Matthew and I are both too big. I am glad that you are still small enough to help us when we need you." "HELP ME! PLEASE help me! I need to see Jehoiada the priest right away! King Ahaziah has died and his mother is trying to kill everyone in the family so that she will be made the queen. I was able to grab the baby and escape, but they are following me. You MUST help me save Joash! You MUST help me save the King!" The priests and Levites working in the temple were astonished to hear the horrible news and summoned Jehoiada to come listen to what the distressed woman was saying. 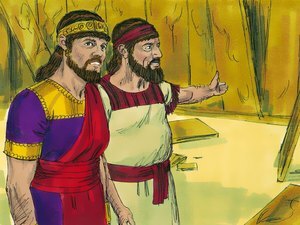 Jehoiada quickly had a room prepared in the temple for baby Joash and his nurse, Jehosheba. For six years they had to stay hidden in order to be safe from the wicked Queen Athaliah. After Joash's seventh birthday, Jehoiada decided it was time for Joash to come out of hiding. "Bring the rulers!" he shouted. "Call for the captains and the guard!" 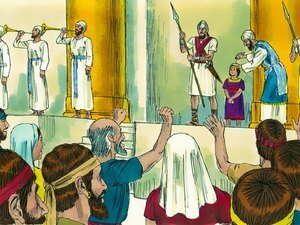 When all the rulers, the captains, and the guard stood before him in the temple, he introduced Joash as the King of Judah. THEY COULDN'T BELIEVE THEIR EARS! They were puzzled and all began asking questions at the same time. "WHAT? How can THIS be the King of Judah? He is just a boy!" "He CAN'T be the King of Judah! Athaliah made sure that the whole family was destroyed so that SHE could be Queen." Jehoiada listened to their questions and comments, told them the story about how Joash was saved, and assured them that he really was the true King of Judah. Then . . . he told them his plan. "One third of you will guard the King's house. One third of you will guard the gate. Some of you will stand watch at the temple, and some of you will surround the King," he ordered. 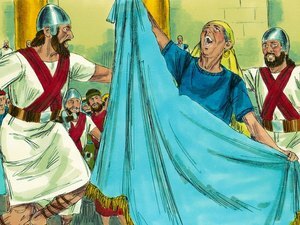 "On the Sabbath day when all the people come to worship, I will bring out Joash, anoint him, put a crown on his head, and declare that he is the King." The rulers, the captains, the guards, the priests, and the Levites waited in anticipation for the Sabbath. Finally the day arrived. People went to the temple to worship, unaware of the great event which was going to take place right before their eyes. Jehoiada waited for just the right moment. Then he stood before the people and waited for silence. "I have a very important announcement to make," he said. At that very moment the captains and the guard escorted Joash to the front of the group. The people were eagerly waiting to see what was going to happen next. They watched as Jehoiada anointed him and placed the crown on his head. "THIS IS JOASH! THIS IS YOUR NEW KING!" they heard him exclaim triumphantly. Immediately there was a rumble of excitement among the crowd. The noise grew louder and louder. The people were thrilled to see the real King crowned. "GOD SAVE THE KING! GOD SAVE THE KING!" they cried at the top of their voices. They clapped their hands and shouted for joy. The air was filled with exuberance as they sang in celebration. When Athaliah heard the noise of the people she went to the temple to investigate. She was angry to see the people rejoicing. She was angry to hear the trumpeters. And she was even FURIOUS when she saw the boy who had been crowned King. "TREASON! TREASON!" she shouted in rage. But Jehoiada commanded the captains and officers to capture the wicked queen so she could be punished. King Joash loved and respected Jehoiada the priest. He wanted to do what was right in the eyes of God and allowed Jehoiada to help him make wise decisions. One day he noticed that the temple was in very bad shape. The walls and the gates were crumbling and were in need of repair. "This is not right," he thought. "The temple of the Lord should be a place of beauty. It should not be falling apart. SOMETHING must be done about this." 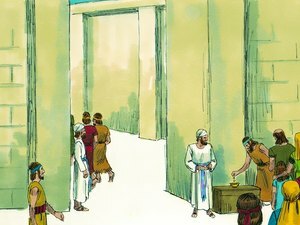 King Joash commanded that the money the people brought for an offering be used for repairing the temple. Jehoiada took a chest and drilled a hole in the top. He placed the chest in the temple near the altar so the people could place their offering in it when they came to worship. The people, glad to give their offerings to the Lord, gave generously and soon the chest was full. Jehoiada was instructed to open the chest. He took out the money and hired many workmen to begin the repairs. 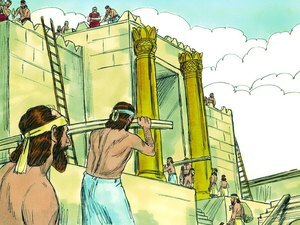 The woodcutters, carpenters, stonecutters, and masons worked together diligently day after day to make the temple a beautiful place for people to worship the Lord. You are never too young to serve God. How old was Joash when he became King? What was the most important thing King Joash did? "Let no man despise thy youth; but be thou an example of the believers"